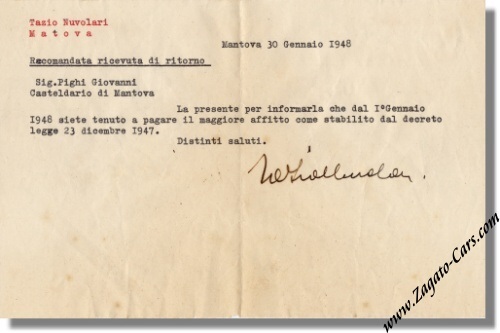 1948 Tazio Nuvolari signed Letter with envelope. What a fantastic piece this is! 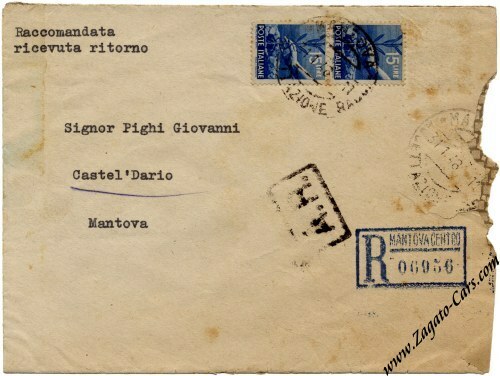 Apparently, Tazio was doing very well in the immediate post-war era as apparently he had lend a sum of money to a Mr. Pighi in Castel d'Ario (a village some 11 miles from Tazio's home in Mantova, Italy) and apparently the legal interest rate had been risen on December 23, 1947 and on January 30, 1948 Tazio sent this letter (registered with return receipt!) to Mr. Pighi informing him that he will be held to pay the increased interest rate. Tazio signed it in full in black ink. It is in excellent condition and comes complete with the original envelope.